My son Cedar LOVES building things; but finding eco-friendly building toys that meet his standard for fun is a challenge. One awesome option that towers over plastic building toys like Legos and K’nex are CitiBlocs. 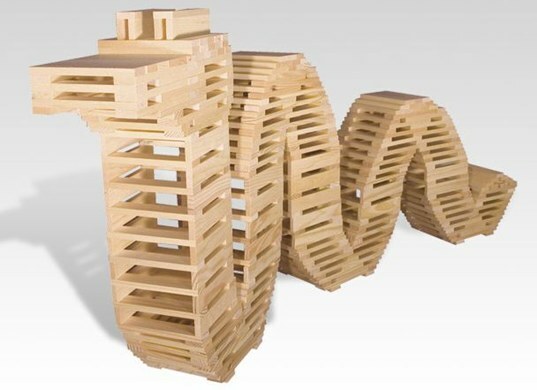 CitiBlocs, a recent winner of the impressive 2009 Oppenheim Toy Portfolio Gold Seal Award are precision-cut wooden building blocks — each lightweight piece is exactly the same shape and size. CitiBlocs do not require glue, snaps, or connectors. Kids are encouraged to create designs that focus on the use of gravity, balance, and imagination. Cedar and I recently tested a set of these award winning blocks. Read on for our review. Eco-Design: Citiblocs are made of Grade A New Zealand Radiata Pine and are certified 100% non-toxic, complying with ASTM F963-03 and CPSIA as well as European Standards for Safety. The pine planks are not treated with any toxic chemicals and they are stained with certified water-based colors to highlight the natural toned pine planks. CitiBlocs Style: We got the natural set, which has aesthetic appeal. We were thinking, if you got some low-VOC paint you could totally jazz up your blocks as you wish. CitiBlocs also come in shades of red and blue. Educational Perks: CitiBlocs really make you think. Because the pieces are all the same size, the quality and stability of your design relies on your ability to figure out the best way to stack, form and balance these pieces into a particular shape. Cedar and I had to try a few times to create a round structure and a bridge structure, and still we haven’t perfected them. You have to think about your structure before you build it — so Citiblocs are a great problem solving developmental toy. For more information on using CitiBlocs as an educational tool download the FREE Citiblocs Education Guide (pdf). Fun Factor: CitiBlocs are fun for the whole family. They are made for ages 3+ but because they’re non-toxic, if a baby gets a hold of one for a minute and chomps, there’s less worry. Kids will love them – Cedar built towers, trucks, a basket with a handle, a solar powered library and more. I had a ton of fun building with Cedar too. Because these blocks offer a problem solving experience, they didn’t get dull. Affordable for families: CitiBlocs are a green toy option that every family can afford. A starter set of 52 planks starts at just $15. Any negatives? : Cedar became frustrated a few times because the design idea in his head didn’t work out so well in reality. He gets an idea and he wants it to work. However, I took this opportunity to talk about design and we brainstormed ideas that might work. Basically, CitiBlocs are a great toy, but if you have a younger child some one-on-one building time with an adult or older child is a good plan. Overall: Cedar and I highly recommend CitiBlocs for families looking for a green toy that’s affordable, fun, and non-toxic. CitiBlocs make a great holiday or birthday gift as well. In fact, Cedar told me, “I’m saving up my own money for another set so I can build lots more bigger and cooler stuff!” A kid saving his own money for a toy – you don’t get a better endorsement than that. My son Cedar LOVES building things; but finding eco-friendly building toys that meet his standard for fun is a challenge. One awesome option that towers over plastic building toys like Legos and K'nex are CitiBlocs. 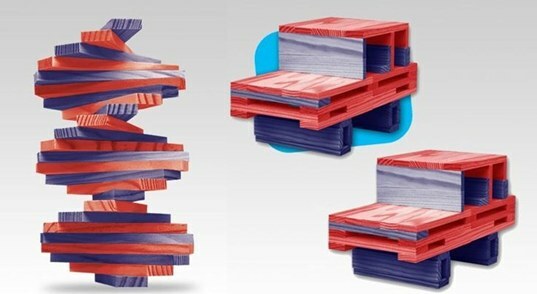 CitiBlocs, a recent winner of the impressive 2009 Oppenheim Toy Portfolio Gold Seal Award are precision-cut wooden building blocks -- each lightweight piece is exactly the same shape and size. CitiBlocs do not require glue, snaps, or connectors. 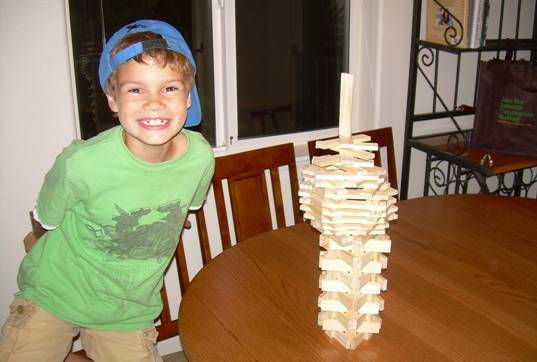 Kids are encouraged to create designs that focus on the use of gravity, balance, and imagination. Cedar and I recently tested a set of these award winning blocks. Read on for our review.